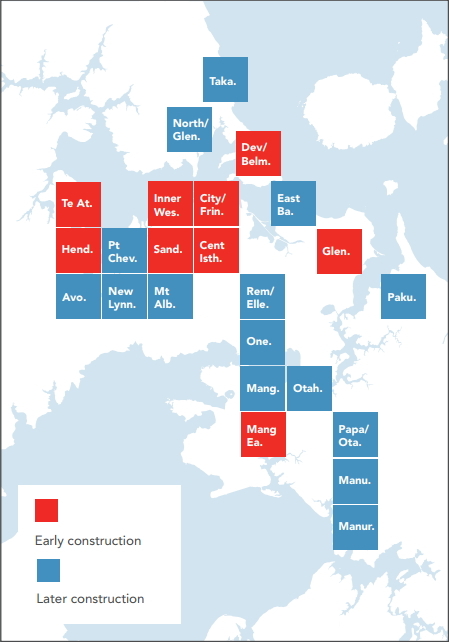 It’s been a pretty exciting time recently with the release of the Auckland Transport Alignment Project (ATAP) and now the Regional Land Transport Plan (RLTP) which is currently being consulted on (consultation closes 14 May). The plans will see many of the things we’ve advocated for over the last decade become a reality in the next decade. However, as we discovered in February, it pays to look closely at what’s funded. In doing so with these documents I’ve noticed an issue that perhaps slipped through the cracks in the rush to create the new ATAP and rework the RLTP. It relates to the cycling budget. And here’s the full section on cycling. It’s listed under the section Walking, Cycling and Local Board Priorities, which combined has a budget of $900 million in ATAP. The emphasis at the end is mine and is important in relation to this post. Over the past few years investment into cycling (including the Urban Cycleway Fund) has increased substantially, from under $20 million a year in 2013 to around $40 million in both 2016 and 2017. Most investment has focused on providing safe and protected cycling infrastructure, which previously only existed along a very limited number of corridors in Auckland (e.g. the Northwestern Cycleway next to State Highway 16). Despite this recent increase, Auckland’s safe cycling network is still very undeveloped and will take sustained investment and effort to be completed. International evidence shows that many American, Canadian and European cities with historically low levels of cycling have been able to dramatically increase ridership through sustained investment in high quality infrastructure. A number of investment areas will contribute to implementing this network over time, including dedicated cycling improvements and those built as part of other projects. The investment levels discussed in this section relate to dedicated cycling infrastructure delivered by either Auckland Transport or the NZ Transport Agency. A programme business case to guide the next 10 years of investment in cycling was approved by Auckland Transport and the NZ Transport Agency in 2017. The analysis undertaken as part of this work emphasised the need to provide complete networks and improve cycling infrastructure in an area-focused way to achieve the greatest gains. This work fed into developing the ATAP Package. Some significant cycling investments along state highway corridors have been included in the ATAP Package. These include SeaPath, SkyPath and a new walking and cycling crossing of the Manukau Harbour between Onehunga and Mangere Bridge. Overall, around $640 million of investment in cycling infrastructure has been included in the ATAP Package. The business case work also suggests additional investment in cycling continues to provide strong value for money. Substantial further increases in cycling investment may create delivery and affordability challenges, but the business case highlights how accelerating the implementation of Auckland’s cycling network provides value and is worth progressing if these challenges can be overcome. There’s no doubt that $640 million is a lot of money and is certainly welcome investment. It also almost identical to the amount needed in the 10-year Programme Business Case (PBC) referenced above that was approved last year. That PBC would see the focus for improving the cycle network spread out from the city to a large number of suburbs around Auckland. Those suburbs were selected after extensive analysis. The problem here is that while ATAP says there’s $640 million for cycling, which is similar to the PBC, much of it is going to projects sitting outside the PBC. For example, the Urban Cycleways Programme was meant to have been completed by June this year and includes projects like Karangahape Rd and Glen Innes to Tamaki Dr. Likewise, the NZTA projects listed weren’t included. So in reality only the $338m is for the PBC meaning close to $300m is missing. There’s no information on what parts of the PBC are unfunded but I’d suggest the blue boxes above are a pretty good guess. Ideally the full $635 PBC would be funded alongside those other projects that have been included. I can understand not including the full amount in the funded section though. The projects that are funded are going to keep AT and the NZTA busy for some time. I also think the agencies need to work on improving their delivery capabilities and quality. The NZTA can seemingly design and consent an entire motorway in the time it takes to deliver a single small cycling project. The RLTP is also renewed every three years so after they got that delivery working well, additional funding can be added in future. However, that $300m for the rest of the PBC should at least be in the list of unfunded projects. If it’s not even included in the unfunded section then it will make it very hard to follow ATAPs recommendation to spend more on cycling if additional funding becomes available. As I said, I suspect this is likely just an oversight in the rush to complete ATAP and the new RLTP but it’s important that it is corrected. If you intend to submit on the RLTP but haven’t yet, we’d suggest including a comment that you’d like to see the full $635m cycling programme business case funded but at the very least, the rest of it included in the unfunded sections. Was there not any real gains to come out of the earmarked ‘safety’ funds for cycle infrastructure? There is lots of bike benefit (safety projects and bikeways as part of other larger projects) outside the dedicated bike funding. See the Bike Auckland article above for some of that. Looks like they must have been far more willing to put in one-way streets than Auckland is. Would that be right? Seville is also dead flat which makes cycling a viable alternative, Auckland on the other hand is not flat, pushing cycling as a form of transport is a waste of money, time and effort. It will only ever appeal to the looney fringe. If only someone could invent a bicycle with gears so it could work in places that aren’t dead flat…. maybe they could even put an electric motor on it. If only. They spend the money on a lot cycleways along arterial road. However cyclists would rather prefer to cycle in quiet tree lined streets with less traffic and fumes. Therefore more money should be spent on cycleways that connects cul-de-sac, schools, local parks, and train stations. Many cyclists would prefer to ride the shortest route to their destination I’d suggest. Often this will be an arterial road. One of the most popular routes in the city is right next to a motorway. I’m not sure your assertion is correct. The money needs to be spent on the arterial cycle lanes. The back streets need a 30 km/hr or lower speed limit, which doesn’t cost much. +1. AT cycle projects often ignore how the aim of the commuter is the same, whatever the mode. You are talking about recreational cycling, which is what most non-cyclists think of. That is like saying all car drivers want to drive on winding mountain roads because they do that in the weekend. I think there are different groups of cyclists. The group I am talking about is kids who wish to cycle from their home to nearby schools and parks. As well as adults who wish to connect from train station to their closeby home. +1 You’re right, Kelvin, for these kids there is more than just a speed limit reduction required. I apologise for that. Whatever happened to the cycleway from New Lynn to Avondale? It went out to market then got pulled. Is it funded, or is it dead? Still going, but was redesigned. The section of path which goes from Chalmers Reserve to the St Georges Road crossing now cuts through the to be built HNZ estate and along St Georges Rd. That was the original plan but it involved an unsafe crossing of St Georges Road and the Western line at the same time. This was highlighted as negative in consultation. In effect the updated route only adds about 100m to the journey. I submitted in favour of the combined road/rail crossing to be changed. The other option would have been an underpass which would be more costly. Does anyone know when the skypath will get underway? It is now included in the proposed-to-be-funded projects, and would be taken over by NZTA. How long to start? Depends on how much they want to redesign. I am not hopeful for an actual construction start at less than 2 years from now. Whether rightly or wrongly, they will have lots of opinions about the originally consented design and want to redesign it, because it wasn’t their own design. Also unfunded – and a key cycling project for the west – is the Te Whau pathway. Yep. Why is Te Whau Pathway not funded by NZTA like the skypath. Westies pay for that flaming pathway by having a monopoly on our liquor which is essentially an extra tax used for council projects . Also Te Whau Pathway is run through a charitable trusts which the usual political suspects as trustees. But they then own a private company called smart trails which is owned by the Te Whau Pathway charity. Need a bit more transparency in this procurement model. Is this so they don’t have to pay tax? Becuase the private business is linked to the charity. Why can’t stuff just be normally procured through a transparent tender process. Feels the $900m is slowly getting chiseled down. The RLTP comes out and $242m of the $900m is reclassified under a completely different heading – Local Boards funding transport initiatives in their areas, this could be carparks, park and rides. There is $153m to finish the previous program which is massively late and over budget. Leaving just $340m for new projects. If AT do not turn their performance delivery around, when will these projects even be designed let alone delivered? There is little momentum in the program, no apparent capability build. The risk is we are sitting here in 3 years time and very little of the $340m is spent. Looking at the long list of unfunded projects in ATAP, there is page after page of roads and no future active transport projects or budgets. There is no evidence of bold aspirations. Does AT still think active transport is a fad that will quietly go away. All I can say is listening to this around 11pm last night it sure is hard to follow the money trail. One things is that it’s usually so much cheaper to do even dedicated cycleways than other modes so hopefully we will get what Auckland needs to catch up with where it should somewhat be. We need more focus than just the very popular, off-road and easy to do areas and get on to Great South Road, difficult intersections & such. Hopefully Jacinda will do a video of this map – it cuts off half of the places that are actually part of Auckland. Where is most of Waitakere and all the beaches, and rural areas. Where is Rodney . I just hope nzta gets someone that knows about cycle way design to design the cycle ways along state highway corridors ,what there doing at Albany to Constellation dr cycle way beside the new bus way is a joke ,at the Albany end it stops at Oteha Valley rd by motorway on/off ramps there is no way to get to the cycle way safely, so it will not get used and theres next to no chance of getting cycle lanes on Oteha Valley because theres no cycle funding north of Takapuna for the next 10 years it will be another disconnected cycle way like the Albany bike highway which nobody uses because it starts in the middle of nowhere and finishes short of some where (the mall ,Albany Bus Station ,North Harbour Stadium)Then theres the Sea Path another joke hardly a seapath the sea is on the other side of the motorway and busway and who would design a cycleway/walkway that you have to cross 5 motorway on/off ramps to get to Takapuna ,theres a total of 19 lanes of traffic to cross to get to Barries Point rd ! I can see someone being hit by a car/truck /bus so much for safe design /zero harm .With the numbers that WILL use this route I can see drivers will get upset with all the cycles and peds crossing the roads all the time .The sad thing is they turned down an idea thats well removed from the traffic flat, direct, and very safe with one road crossing at traffic lights which are already there ,they would only have to fit a beg button and paint a crossing on the road .Sea Path would become an Auckland icon if it was to be built on the eastern side of the motorway over Shoal bay like the Westhaven path over the water ,and have next to no enviromental inpact on the wildlife in the bay .It would be prefabed off site which would make it a shorter build time and less inpact on the enviroment during construction (safer for the workers as they would be nowhere near motorway traffic during construction ).Another plus for the cycle/walkway you could put info boards on it to inform people of the history and wildlife in the bay which would rise the profile of the NZ Dotterels ,under the cycle/walkway you could fit a mesh/filter that would stop rubbish from the motorway getting into the bay ,stop preditors getting out to the shell bank nesting sites 120m off shore ,it would also stop the birds from getting to the motorway ,its a win win for all. I know that the motorway will be widened some time in the future or a light rail /tunnel will come shore at/near the Northern Busway station being the only large parcle of clear land by the transport corridor so they could design the Sea Path so it could be disassembled and move further east to make way for any widening /rail/tunnel but at the speed things happen they wont have to move it for at lest 20 years . We know nzta can build safe direct roads so why can’t they use the same knowledge to build safe direct cycle way that will be used by all of any age ? 1/ I’ve come to the conclusion that the cycleways should have the intersections designed first. If these can’t be sorted, no point for the rest. 2/ Given the huge problem of our road runoff, maybe retrofitting the roads for treatment should be linked with cycleway design. So with your Seapath alternative route, it could not just trap rubbish, but also treat runoff. Another thing to be spending money on instead of inducing more traffic on our roads with new and widened roads.